1. Since the community is new you can vote without posting or being stamped for 1 weeks or at least until we get enough members so please vote away! 2. Do not try to make your application as the character you want please be honest. Be yourself! 7. Keep your choices on only 3 characters at most! 9. After one week of voting you will be stamped also if you have more than at least 5 votes if you don't your post will be left to be voted on more and we will try to encourage members to vote if they haven't so. 10. Last but definitely not least be nice to other members! 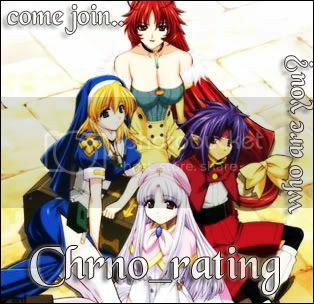 <a href="http://www.livejournal.com/community/chrno_rating"><img src="http://i3.photobucket.com/albums/y70/shader_neko/chrno_rating.jpg" border = "0"></a> <br>Join <lj comm="chrno_rating">! Disclaimer: Chrno Crusade and all characters are © Daisuke Moriyama. We're just crazed fans!